The company said it will fund the deal by selling additional stock. Seattle-based pet-insurance company Trupanion said Wednesday it is buying its Georgetown headquarters for $65 million and planning a stock offering to fund the deal. The price includes $55 million in cash and $10 million worth of stock. It’s a bit of a contrarian move for the growing business: A lot of local companies, big and small, lease their offices, and some that have traditionally owned their workspace have sold their properties to free up cash. But soaring office rents and property prices have made owning look more attractive. Benaroya Capital, the seller of the building at 6100 Fourth Ave. S., bought the property for $26.3 million in 2005. “Trupanion is seeking to reduce its fixed expenses and expand the funds available to invest in growth and drive other strategic initiatives,” the company said in a statement. Trupanion will also likely be landlord to the two other companies based in the 230,000-square-foot office: Sur La Table and AeroTEC. And while the local real-estate market has surged, so has the stock market: Trupanion’s stock price has roughly doubled in the past year. Its market capitalization stood at $1.3 billion Wednesday. The company, founded in 2000, provides medical insurance for dogs and cats in the United States and Canada. It went public in 2014. It moved to its Georgetown location from a smaller office in Ballard in 2016. 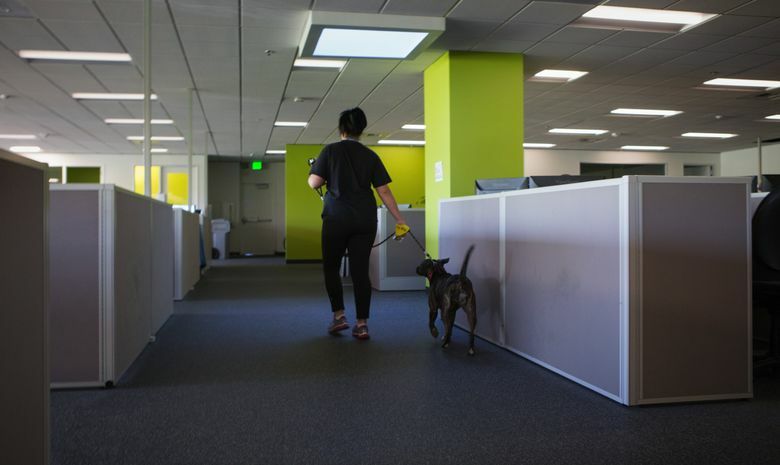 It now has more than 500 employees — and their 200 pets — up from 425 workers in 2016 and 335 at the end of 2013. Its stock dropped about 5 percent in after-hours trading after the stock offering and building acquisition were announced.